Discover a tale of everlasting love hidden in the pages of a vintage scrapbook. "Beautiful story line and fun puzzles. I fully enjoyed this installment as I did with the other Dream Day games." Travel across the country and abroad as you prepare an amazing Anniversary celebration for Bill and Helen. Restore romantic pictures from their early courtship, gather the flowers that brought them together when separated by the war, collect special gifts, and discover a timeless tale of everlasting love hidden in the pages of a vintage scrapbook. 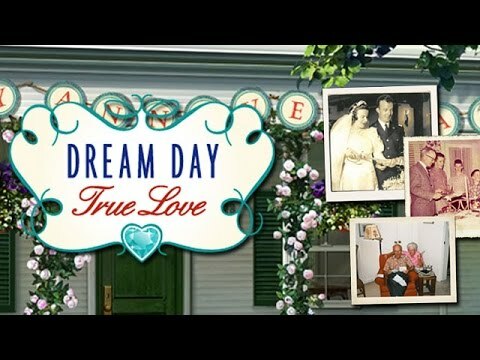 Take your Dream Day planning to a whole new level in this True Love story, brought to vivid life. This one carries on the theme of the other "Dream Day" games and I thoroughly enjoyed playing it. I love all of the Dream Day hidden object games. I like to play these types of hidden object games for enjoyment and relaxation. I enjoyed this one a lot. This game is amazing. I love how it combined search-and-find with baking, and putting things together.